Culture and Climate Change: Recordings is a publication based on the series of panel discussions, Mediating Change, and is available online as a pdf from the Open University, or it can be ordered as a book by email. The publication maps out this new field in the arts and sciences. 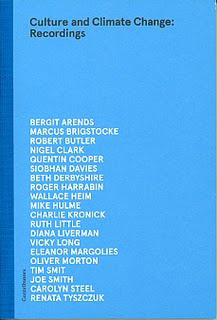 Contributors include Mike Hulme, Tim Smit, Siobhan Davies, Roger Harrabin and Marcus Brigstocke. The four dialogues included are History, Publics, Anatomy and Futures. Edited by Robert Butler, Eleanor Margolies, Joe Smith and Renata Tyszczuk, the publication supplements the Mediating Change podcasts with three introductory essays, an extensive timeline, resources and footnotes. The podcasts of the Mediating Change panel discussions are available to download from the Open University's iTunes page here. The discussions brought together artists, writers, film-makers, scientists, academics and journalists with a comedian, a choreographer, a campaigner, an entrepreneur, and an architect. 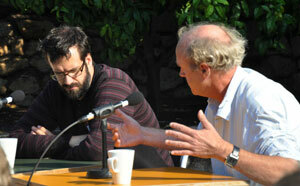 The podcasts have been sponsored by the Open University’s Open Space research centre and the Ashden Trust. 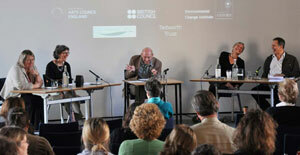 The discussions, each in front of a live audience, were chaired by Quentin Cooper, presenter of BBC Radio 4's 'Material World' programme. 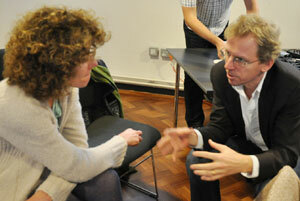 These discussions consider how humanity is making sense of an extraordinary new body of knowledge. Knowledge of climate change raises huge philosophical and cultural questions about who and what counts - now and in the future. We want these recordings to help artists, writers, filmmakers and others to understand the context in which they are working and to place their own work in relation to that of others. Professor Diana Liverman, Professor of Geography and Development and Co-Director of the Institute of the Environment at the University of Arizona. at the Mediterranean Biome, the Eden Project. Clare Patey at the 'Anatomy' panel. Professor Mike Hulme, Professor of Climate Change at the University of East Anglia and author of Why We Disagree About Climate Change. Ruth Little, writer, dramaturg and associate director of Cape Farewell. click here if you already have iTunes on a PC or MAC. or click the link open.edu/itunes/. This link will take you to an ‘Open University’ website, from here you will need to follow the link to ‘OU on iTunes U’, which will launch the ‘iTunes Store’ on your computer. Alternatively if you already have iTunes, go to the ‘iTunes U’ menu at the iTunes Store. The ‘Mediating Change’ series of podcasts can be found in the Open University ‘Environment, Development and International Studies’ section of ‘iTunes U’. The podcasts are contributing to a research project being developed by researchers at the Open Space research centre, The Ashden Trust and Sheffield University’s Architecture School. itunes.apple.com/us/itunes-u/mediating-change-audio... Our story on the Mediating Change panel discussions and the podcasts is here.